As the U.S. presidential election hits its final strides, political advertisements will be impossible to avoid; especially for those in 'battle-ground' states. Along with the 24-hr news cycle, the messages from the candidates will be flowing at break neck speed. For those who are undecided, this presents a problem: how much of the message is fact and how much is spin? With so many biased sources, who can one trust for the straight scoop? Any time that I hear a quote or ad that seems a little fishy, I check out www.FactCheck.org. 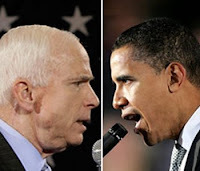 They seem to be a great place to get get an unbiased check of the statements of both McCain and Obama. We are a nonpartisan, nonprofit, "consumer advocate" for voters that aims to reduce the level of deception and confusion in U.S. politics. We monitor the factual accuracy of what is said by major U.S. political players in the form of TV ads, debates, speeches, interviews, and news releases. Our goal is to apply the best practices of both journalism and scholarship, and to increase public knowledge and understanding. I cannot vouch 100% for their validity, but I highly recommend you consult them before trusting anything straight from the campaigns. It is at least another data point on which to base your decision. Good luck. They're owned by University of Pennsylvania. So it seems to be relatively safe source.